The Boeing 367-80 "Dash 80" is towed to the Steven F Udvar-Hazy Centerin 2003. The prototype 707, America's first jet airliner, made its first flight on July 15, 1954. The Boeing Dash 80 makes its final landing at Washington Dulles International Airport before going on display at the National Air and Space Museum' s Steven F. Udvar-Hazy Center, seen in the background. U.S. civil aviation entered the jet age on July 15, 1954, when the Boeing 367-80, or "Dash 80," first took flight. Designed for the U.S. Air Force as a jet tanker-transport, this airplane was the prototype for America's first commercial jet airliner, the Boeing 707. The Boeing 367-80, known as the Dash 80, takes off from Seattle on its first flight since 1991 in preparation for its final trip to Washington Dulles International Airport and display at the Steven F. Udvar-Hazy Center. An interesting nose-to-nose comparison with the early era turbojet, the Boeing Dash 80, in the foreground and the supersonic Concorde in the background. The airliners are parked next to each other temporarily at Dulles Airport before being moved into the Steven F. Udvar-Hazy Center. Panoramic view inside the Boeing 367-80 Dash 80. Panoramic view inside Boeing 367-80 Jet Transport Rear Cabin. Panoramic view inside Boeing 367-80 Jet Transport Cabin. On July 15, 1954, a graceful, swept-winged aircraft, bedecked in brown and yellow paint and powered by four revolutionary new engines first took to the sky above Seattle. Built by the Boeing Aircraft Company, the 367-80, better known as the Dash 80, would come to revolutionize commercial air transportation when its developed version entered service as the famous Boeing 707, America's first jet airliner. In the early 1950s, Boeing had begun to study the possibility of creating a jet-powered military transport and tanker to complement the new generation of Boeing jet bombers entering service with the U.S. Air Force. When the Air Force showed no interest, Boeing invested $16 million of its own capital to build a prototype jet transport in a daring gamble that the airlines and the Air Force would buy it once the aircraft had flown and proven itself. As Boeing had done with the B-17, it risked the company on one roll of the dice and won. Upon the Dash 80's first flight on July 15, 1954, (the 34th anniversary of the founding of the Boeing Company) Boeing clearly had a winner. Flying 100 miles per hour faster than the de Havilland Comet and significantly larger, the new Boeing had a maximum range of more than 3,500 miles. As hoped, the Air Force bought 29 examples of the design as a tanker/transport after they convinced Boeing to widen the design by 12 inches. Satisfied, the Air Force designated it the KC-135A. A total of 732 KC-135s were built. Quickly Boeing turned its attention to selling the airline industry on this new jet transport. Clearly the industry was impressed with the capabilities of the prototype 707 but never more so than at the Gold Cup hydroplane races held on Lake Washington in Seattle, in August 1955. During the festivities surrounding this event, Boeing had gathered many airline representatives to enjoy the competition and witness a fly past of the new Dash 80. To the audience's intense delight and Boeing's profound shock, test pilot Alvin "Tex" Johnston barrel-rolled the Dash 80 over the lake in full view of thousands of astonished spectators. Johnston vividly displayed the superior strength and performance of this new jet, readily convincing the airline industry to buy this new airliner. In searching for a market, Boeing found a ready customer in Pan American Airway's president Juan Trippe. Trippe had been spending much of his time searching for a suitable jet airliner to enable his pioneering company to maintain its leadership in international air travel. Working with Boeing, Trippe overcame Boeing's resistance to widening the Dash-80 design, now known as the 707, to seat six passengers in each seat row rather than five. Trippe did so by placing an order with Boeing for 20 707s but also ordering 25 of Douglas's competing DC-8, which had yet to fly but could accommodate six-abreast seating. At Pan Am's insistence, the 707 was made four inches wider than the Dash 80 so that it could carry 160 passengers six-abreast. 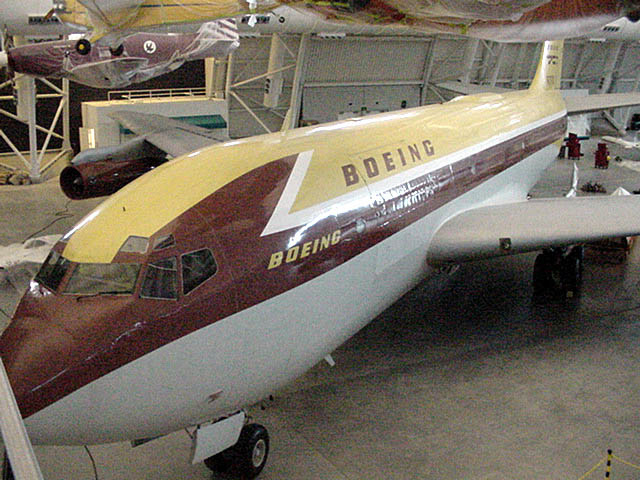 The wider fuselage developed for the 707 became the standard design for all of Boeing's subsequent narrow-body airliners. Although the British de Havilland D.H. 106 Comet and the Soviet Tupolev Tu-104 entered service earlier, the Boeing 707 and Douglas DC-8 were bigger, faster, had greater range, and were more profitable to fly. In October 1958 Pan American ushered the jet age into the United States when it opened international service with the Boeing 707 in October 1958. National Airlines inaugurated domestic jet service two months later using a 707-120 borrowed from Pan Am. American Airlines flew the first domestic 707 jet service with its own aircraft in January 1959. American set a new speed mark when it opened the first regularly-scheduled transcontinental jet service in 1959. Subsequent nonstop flights between New York and San Francisco took only 5 hours - 3 hours less than by the piston-engine DC-7. The one-way fare, including a $10 surcharge for jet service, was $115.50, or $231 round trip. The flight was almost 40 percent faster and almost 25 percent cheaper than flying by piston-engine airliners. The consequent surge of traffic demand was substantial. 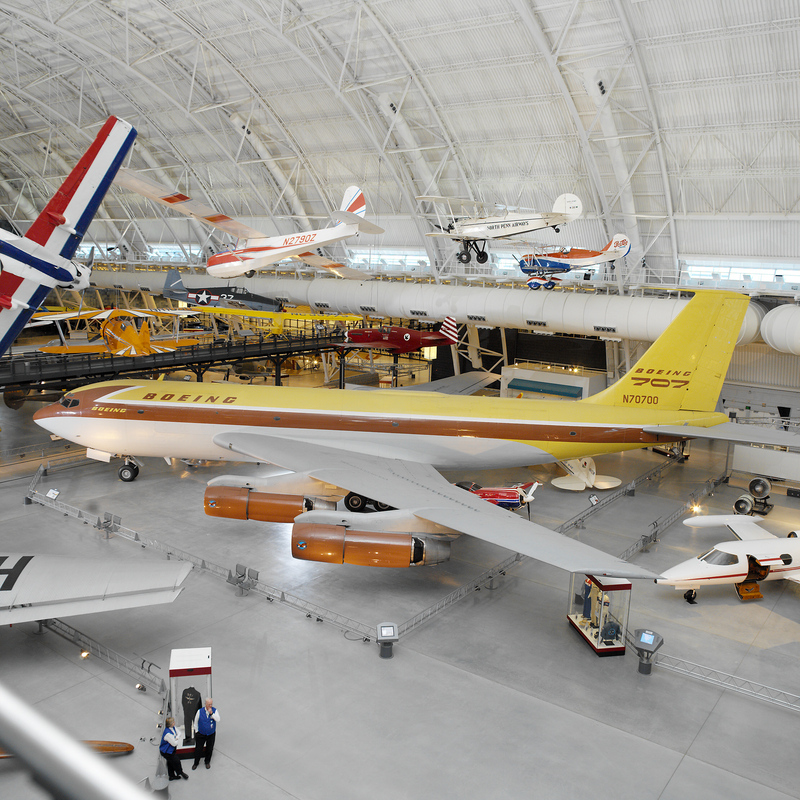 After a long and distinguished career, the Boeing 367-80 was finally retired and donated to the Smithsonian in 1972. At present, the aircraft is installated at the National Air and Space Museum's new facility at Washington Dulles International Airport. Height 19' 2": Length 73' 10": Wing Span 129' 8": Weight 33,279 lbs.